After many years of neglect, downtown Hollywood is being reborn, and the Hollywood & Highland project is at the center that renaissance. It is a massive project that occupies almost two city blocks in the heart of Hollywood, a combination of shops, restaurants, clubs and live theatre. Hollywood & Highland opened in 2001, just across the street from the rejuvenated El Capitan Theatre, kitty-corner to the Hollywood Roosevelt Hotel, and right next to the legendary Grauman's Chinese Theatre and its famous forecourt of stars footprints. It is home to over 60 stores, nine estaurants, six new movie theatres, two nightclubs and the 640-room Renaissance Hollywood Hotel. The project cost a whopping $615 million dollars. To put that in perspective, the massive Mall of America, the largest enclosed mall in the world, cost roughly the same to build. 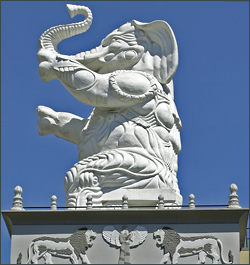 Disneyland's newest theme park, Disney's California Adventure, cost just twice as much (and features the same iconic elephants). We're talking big bucks here folks. And the company behind it, the TrizecHahn Corporation, had a history of success, including the Horton Plaza in San Diego. Advance artist sketches looked very promising: a soaring, multistory complex with grand stairways, imposing archways and Hollywood theming, including a spectacular Babylon Court, featuring mammoth pillars topped by marble elephants (reminiscent of D.W. Griffith's classic "Intolerance" set), and a towering archway framing the Hollywood Sign in the distance. The new complex has certainly helped revitalize the neighborhood, and it has lent a busy, bright Times Square ambiance to the corner after dark that is certainly a welcome improvement. Every year, over 10 million tourists come to Hollywood Boulevard. But in the past, they used to stay for less than 20 minutes because there simply wasn't much to do there. It lacked focus. Hollywood & Highland filled that need - in a very big way. It provides a spectacular center of focus for the neighborhood, creating an automatic tourist Mecca (next to the landmark Chinese Theatre) that will no doubt be visited by just about everyone who comes to Hollywood. Beyond that, it is attracting upscale businesses to the surrounding neighborhood, which are slowly but surely replacing most of the tawdry souvenir and t-shirt shops which cluttered up the area. The project also created 2,430 permanent jobs. But the reality is that (as of 2007) the center itself hasn't been the kind of resounding success that people expected it to be. In fact, just three years after it was built (in 2004), the Trizec Hawn corporation sold the Hollywood & Highland center to new operators for just $200 million. It was a number of small things... First, for such a glitzy mall, the mix of tenants can be surprisingly pedestrian. Visitors to the Babylon Court encounter the likes of Victoria's Secret, Ann Taylor, Bebe, Brookstone, Lucky Brand Jeans... There's nothing wrong with those popular stores, of course, but it's just that they can be found at most average malls... There are more upscale shops at Hollywood & Highland, but they tend to be hidden away in the enclosed galleria section (a tunnel-like walkway leading from the Boulevard to the Kodak, walked each year by the Oscar attendees). The worst problem may be the center's labyrinthine layout - it's many levels and walkways can be confusing and difficult to navigate for first time visitors. Some architectural critics complained that the center was isolated from the Boulevard (by those grand stairs), while others attacked the design (and the "white elephants" in particular) as inherently ugly. Some pieces of the Hollywood & Highland puzzle, touted at the start, simply never materialized, such as the Debbie Reynolds Museum (which never managed to get the financing it needed) and the Quincy Jones nightclub. Other elements were on schedule, but didn't perform as well as expected. The Kodak Theatre, for instance, does a spectacular job in its main role as the permanent home of the annual Oscar show, but keeping acts booked to fill the auditorium for the rest of the year proved to be too much of a challenge in such a competitive market. 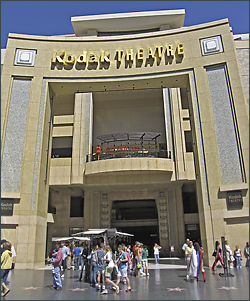 In 2007 (after the opening of the new Nokia Theatre in downtown), the Kodak announced that they were giving up on booking regular acts, and signed a deal with Cirque du Soliel to stage a permanent, Hollywood-themed show at the Kodak year-round (except during Oscar week, of course). But that midstream correction shows an admirable willingness on the part of the center to adapt to changing times and tastes. Chances are that a Cirque du Soliel show be greeted with open arms by the tourists who flock to the area, and will become yet another "wow!" attraction at this key corner. Likewise to correct the problem with street access, they installed a new system of escalators to move pedestrians directly from Hollywood Boulevard up to the main courtyard. A new Madame Tussaud's wax museum opened in 2009 at the corner just west of Grauman's, a popular addition that should help the area achieve critical mass. And in July 2010, a new Hard Rock Cafe opened at Hollywood & Highland - right on Hollywood Blvd, tucked between the Kodak Theatre and Grauman's Chinese. (How's that for a choice spot?) It's 20,000 square feet, and seats 400 diners. As with all Hard Rock Cafes, it features celebrity memorabilia, including items from Michael Jackson, Janis Joplin, Jim Morrison’s, Katy Perry and the Black-Eyed Peas, just to name a few. But this branch also features some cutting edge technology (such as an interactive media wall) you'll have to see to believe. It is also a blessing that the center sits right on top of the new Red Line subway station. The subway (reached via underground escalators) is clean and safe and offers a quick & easy way to head east to Hollywood & Vine (to see the Pantages or the new "W" Hotel that opened there in 2011), or even north up to Universal City. Other positive features at Hollywood & Highland include a TV Guide Channel studio, a KROQ broadcast studio, the Grand Ballroom (which hosts the annual post-Oscars banquet), a guided tour of the Kodak Theatre (where the Oscars are held), the trendy Lucky Strikes bowling alley, the Highlands Nightclub, and impromptu outdoor concerts and events in the courtyard. While there, you might encounter an American Idol screening or a TV Guide interview...or perhaps a live jazz and wine event in the Summer. And that's not to mention the center's proximity to the Grauman's forecourt, with its classic display of Hollywood stars' footprints-in-cement. Grauman's may be the ultimate Hollywood landmark, rivaled only by the Hollywood Sign (which is also visible from the center). And then there's Oscar Night. Just bringing the Academy Awards home to downtown Hollywood (after decades of the show being held in other parts of L.A.) is a huge accomplishment in its own right, and the new center did it with style. 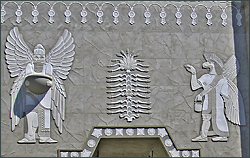 The entire Hollywood & Highland project was designed with the Academy Awards telecast in mind, and it includes a grand, dramatic entrance for the celebrities who arrive. The stars exit their limos on Hollywood Boulevard onto a red carpet that runs from the curb, through the complex, to the Kodak Theatre. To their left (west) will are bleachers full of fans. To their right (east) is the press area for interviews. They pass through a splendid glass archway, then follow the red carpet up Orchid Walk through crystal hallways to the lobby of the theatre. Getting there: The name tells the address. The project is located on the northwest corner of Hollywood Blvd and Highland Avenue in the heart of Hollywood. It is right across the street from the El Capitan Theatre and immediately east of Grauman's Chinese Theatre.